I love dinners that come together on sheet pans in the oven. These Sesame Chicken Harvest Bowls are a delicious and easy way to get a nutritious dinner on the table and they are really easy to modify to your liking. This post contains affiliated links. 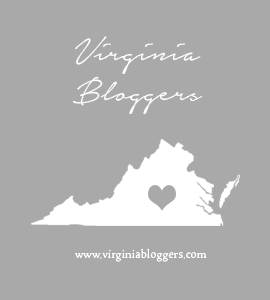 As always I will only ever suggest products I use and love. I use sweet potatoes roasted with miso, and chicken drizzled in sesame oil and soy sauce on one sheet pan. Then I have mushrooms, green beans, and a red onion or shallot if I have it on hand roasting in the other. They all get nice and soft, caramelized and brown then go on top of flavored rice or quinoa. 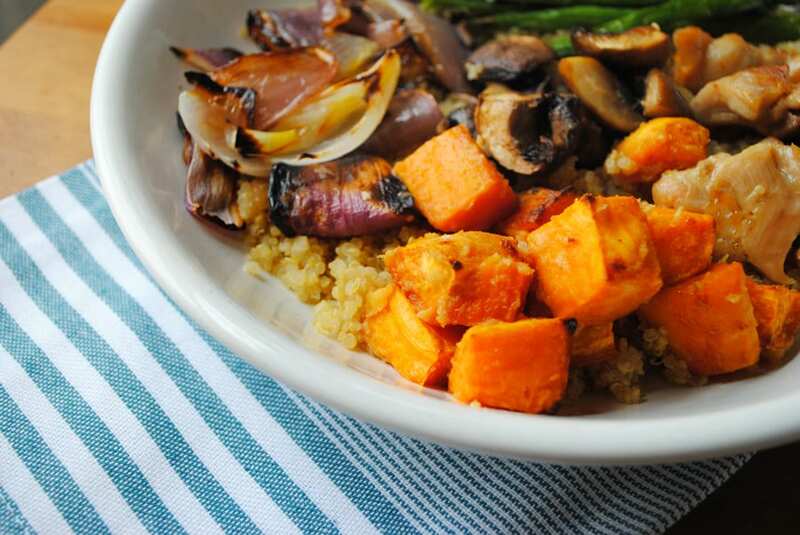 You can leave out the rice and quinoa, or substitute any vegetables you want to the mix. Miso is available where you buy tofu and wonton wrappers at the grocery store in a refrigerated section. You can also grab it on Amazon. A little goes a long way with miso. I suggest storing it in your freezer and using it as needed. It stays soft enough that you never have to defrost it. It’s really versatile and flavorful. There are all different kinds, brown, red, white. I love red and white miso. White is more mild. Red and Brown are soybeans that are fermented with even more soy beans for a longer period of time, whereas white is fermented with more rice and for a shorter period of time. If you can’t find miso, it is not necessary at all for the recipe. Just toss the sweet potatoes in sesame oil and salt before roasting. Line two sheet pans with parchment paper, or aluminum foil to prevent sticking. In a small bowl mix the miso with 1 1/2 tbsp water and 1 tbsp olive oil. It will be a runny paste. 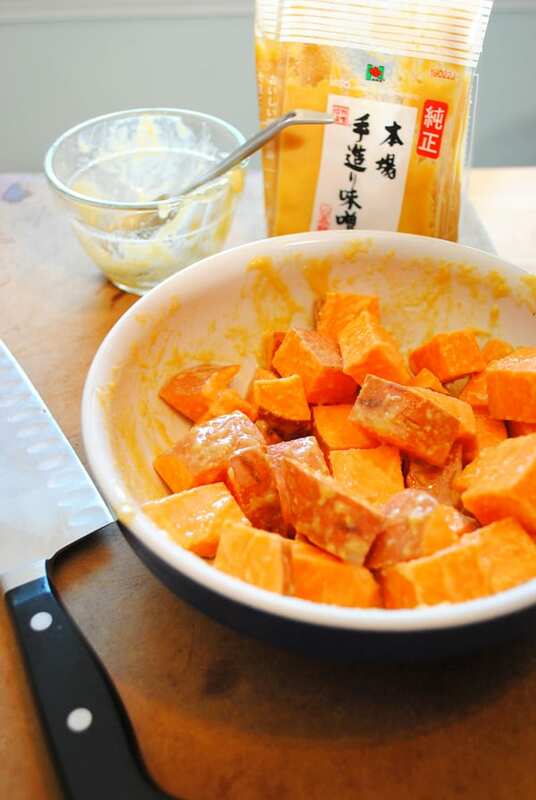 Mix the miso mixture with the sweet potatoes and spread on one half of a sheet pan. Then mix the chicken with 2 tbsp sesame oil and 1 tbsp soy sauce. 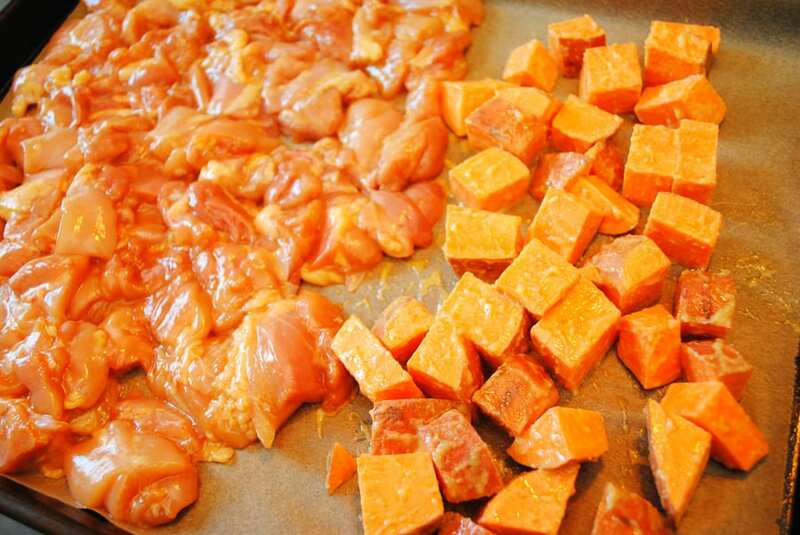 Spread the chicken on the other half of the sheet pan from the sweet potatoes. Place the sheet pan in the oven for 25 minutes. Meanwhile prepare the rice. Place 2 C water in a small saucepan (1.5 C for quinoa) along with 1 tbsp sesame oil and 1 tbsp soy sauce. Bring to a boil, then toss in the rice and stir with a fork. Immediatly turn the heat all the way to low and cover. Cook for 15 minutes, stirring occasionally, or until the liquid is absorbed and the rice is soft. White rice cooks faster then brown. Quinoa cooks about as long as white rice. Once it's done, set it on a cool burner and leave it with the lid on to stay warm while you prepare the bowls. 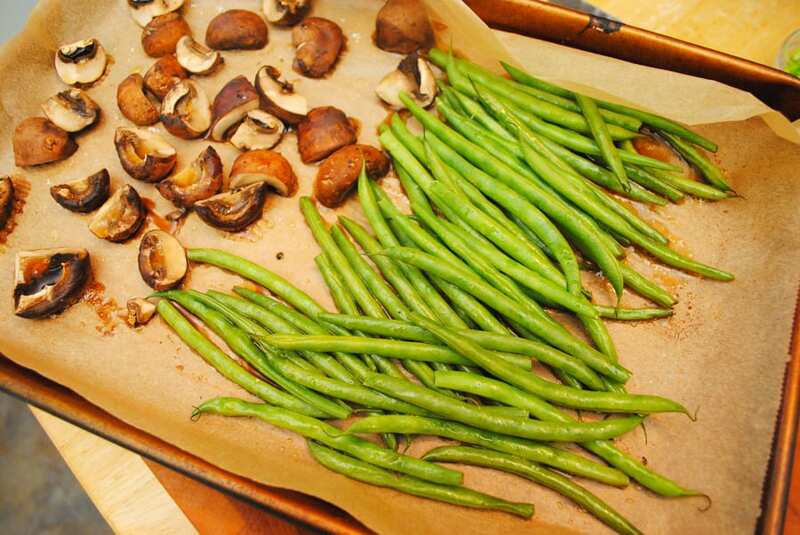 Toss the green beans and mushrooms with 1 tbsp sesame oil and 1/2 tsp kosher salt. 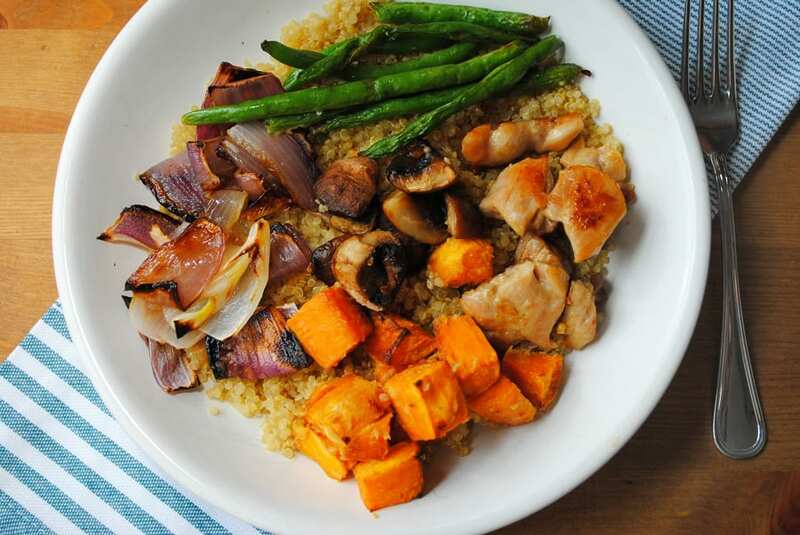 Once the timer goes off after 25 minutes for the chicken and sweet potatoes, add the veggie sheet pan to the oven to cook with the chicken and sweet potatoes for 15 more minutes. After 15 minutes, remove the veggie sheet pan and drizzle with 1 tbsp soy sauce. Move the chicken and sweet potatoes to the top third of the oven, set the broiler to high and broil for three minutes, to brown the chicken and potatoes a little bit. Divide the rice among four bowls or plates, then divide the chicken and vegetables among the bowls. On top of the grain. Sprinkle with sesame seeds, chopped green onion and sesame oil to your liking if desired.